BALTIMORE (CNS) — The U.S. bishops voted Nov. 14 to move forward the sainthood cause of Nicholas W. Black Elk, a 19th-century Lakota catechist who is said to have introduced hundreds of Lakota people to the Catholic faith. Bishop Robert D. Gruss of Rapid City, South Dakota, spoke to the bishops about Black Elk, born into the Oglala Lakota Tribe in 1863 in Wyoming. “This vision influenced his life over the rest of the years, especially as a catechist, in many ways forming his identity over the rest of his life,” Bishop Gruss said. He took the name Nicholas, after St. Nicholas, the bishop said, and was baptized on his feast day. He was a witness to Battle of the Little Big Horn in 1876 in Montana Territory and the great massacre of his people at Wounded Knee in South Dakota, the bishop said. “With little formal schooling, he learned to read and write and the sacred Scriptures became his friend,” Bishop Gruss said. He said to have educated more than 400 of his people about the Catholic faith, and many were baptized during his 40 years of his life as a catechist. “As we know, catechists were the lifeblood of the early faith communities of the Lakota people, leading others to conversion,” Bishop Gruss said. 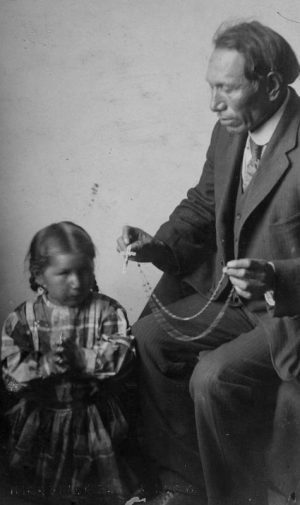 “Black Elk, Catholic, husband, father and elder, he was an ardent catechist and an internationally admired mystic,” he said, and the missionary disciple that Pope Francis calls others to be.